250,000 join Chicago Women’s March | Fight Back! 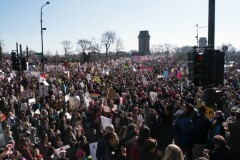 On a bright, warm day, an estimated 250,000 people turned out for the Chicago Women's March. As supporters of the Women's March Chicago filled the streets, their number grew so large that event organizers canceled a planned march to the Federal Plaza. Thousands took to the streets anyway, raising their voices and chants for women's rights, immigrant rights, and against Trumps’ destructive agenda. Chants could be heard that women will not “go back,” they will fight back.